It's often a better deal to buy conventionally dehydrated apricots unless you are lucky enough to have a tree. Apricots are usually quite easy to dehydrate but should be pretreated to prevent spoilage while they're drying. Apricots dehydrate very well, and depending on your location, can be purchased pre-dried less expensively than when fresh. If you dehydrate them yourself, try to select firm, ripe apricots that are deep yellow to orange in color. To prevent browning and spoilage, apricots will benefit from being treated with sulfite dip, ascorbic acid dip, or syrup blanching. (Optional) Tare (zero) your scale with your empty drying rack in place. Wash apricots, halve, and remove pits. (Optional) Pre-treat the apricots with sulfite dip, syrup blanching, or ascorbic acid dip. Arrange the apricots in drying trays in a single layer, grouping apricots of similar size in the same trays to ensure the fruit in each tray uniformly finishes drying at about the same time. (Optional) Weigh the drying rack with fruit on your tared kitchen scale and record your measurement. Multiply this weight by 0.175. The result is the target weight for the same tray when the fruit is adequately dried. Apricots halves dry best in a dehydrator, and it is difficult to obtain good results in a convection oven due to the size of the fruits. 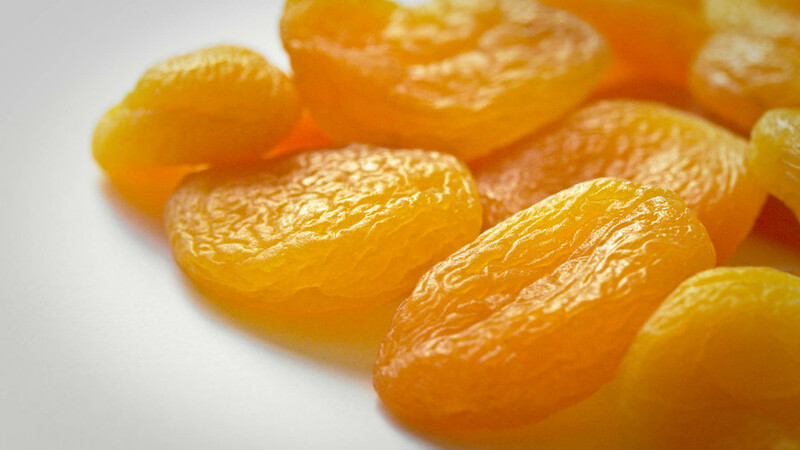 Dryness test: Apricots are adequately dried when they weigh approximately 0.175 times their weight when fresh. Storing: Let the dried fruit rest covered overnight so the moisture distributes evenly. If you are in a humid environment, skip this step, but wait to pack the fruit until it has cooled to room temperature and carefully check each piece of fruit to make sure it is dry. Pack the dried apricots into Ziploc bags or vacuum pack, and refrigerate or freeze until you are ready to eat.